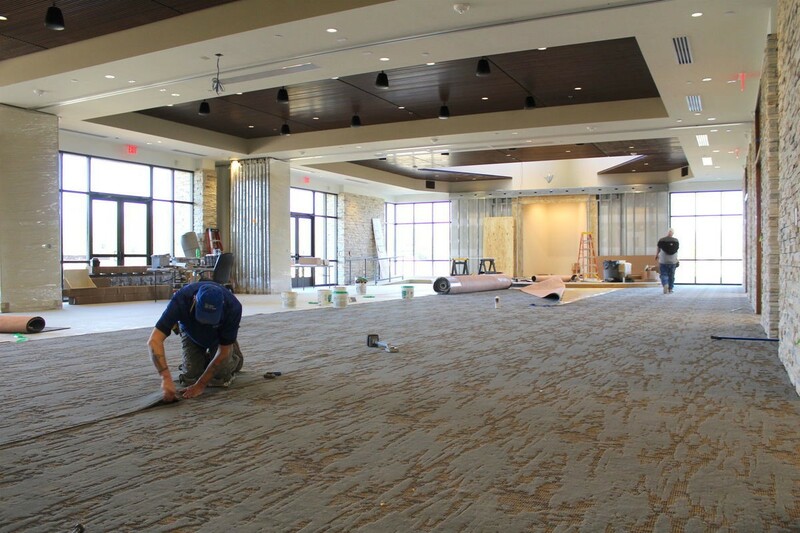 EASTON — The new Temple B’nai Israel is poised to open its doors to Jewish congregants, as well as to the Mid-Shore community, next month as the finishing touches are added to a project that began with its June 4, 2017, ground-breaking. The new home of Temple B’nai Israel, the Satell Center for Jewish Life on the Eastern Shore, is a nearly 9,500-square-foot building at 7199 Tristan Drive, on 6 acres of rural land that faces the Easton Parkway. “The new synagogue is an effort of this congregation to create a building that is as useful as it is beautiful for our own needs and for the needs of the community,” said Arna Meyer Mickelson, president of the congregation. The 200 members of the Reform congregation hope to move into the new building in early April, but a weekend of festivities to dedicate the building is planned for the weekend of June 8 to 10 for the congregation and community. During the dedication, the congregation will march the recently restored Torah scrolls nearly 2 miles from their ark at 101 W. Earle Ave. in Easton to their new home. The new synagogue was planned for seven years. “It was a long process, but the right people stepped up at the right time,” Meyer Mickelson said. Site preparation for the new building began a year ago. “We talked a lot about who comes to Easton, who moves here, who decides to live on the Eastern Shore, are into nature, into the environment, into the beauty of this area, so therefore the decisions for the windows, for the natural stone — all those decisions were based on (the idea that) this is a special place,” Meyer Mickelson said. The entire space, both inside and out, was designed to be functional, modular and inviting. It’s also sleek yet natural, with soft and edgy contemporary design elements — think Danish modern with touches of rustic, country charm. The V-shaped, raised roof “monitor” that soars above the clear story on the front of the synagogue creates a striking new landmark along Easton Parkway. As people enter the glass-wrapped foyer, stretching before them is a lobby the size of a modest home. Named the Rabbi Peter E. Hyman Lobby in honor the synagogue’s spiritual leader, the 1,745-square-foot corridor will hold seating areas, a coffee bar and synagogue memorabilia. The space is filled with natural light from its eastern exposure. Visible through the large windows are Sts. Peter & Paul Roman Catholic Church and Immanuel Lutheran Church. The lobby’s stone wall will be home to a fragment of the congregation’s Holocaust Torah and a memorial box that will house the ner tamid (eternal light) from the former synagogue. Kaddish (prayers for people who have died) in both English and Hebrew will be placed on the wall. The Hebrew Kaddish will be lettered by Hyman, who also is a talented calligrapher. Names memorialized in the current synagogue will be transferred to parchment in a more modern treatment and displayed in the lobby. After the Friday evening service, worshipers will gather in the space for food and fellowship. The congregation was founded in 1950. The single-story building is environmentally sustainable and completely handicap accessible. It is very different from its tiny brick predecessor tucked into a lot that adjoins the parking lot of the University of Maryland Shore Medical Center at Easton. The wall separating the lobby and sanctuary is constructed of rough-hewn stonework. It reminds some people of Jerusalem, Meyer Mickelson said. The modern carpeting is reminiscent of shifting sand or rugged outdoor terrain. “You have a grey wall here, so you’re going from this warm color all the way to the beige, and the carpet color slides across in the same way,” Meyer Mickelson said. The color gradations of the carpeting in the lobby seem to draw people into the sanctuary space, she said. The multi-purpose sanctuary is designed to accommodate 250 people when it’s fully opened. It can be divided into three smaller areas for concerts, lectures and films for congregants and the community. A drop-down projector screen on the west side is designed for showing films. Seating also will be modular. Rulon linear stained, open style wood strips comprise the acoustical ceiling. On the east side of the sanctuary, the rising sun fills the bimah with natural light. Doors are designed to cover the ark, the cabinet in which the Torah scrolls are stored, when the sanctuary is used for secular events or activities, such as “lots of concerts” and weddings for those of other faiths, Meyer Mickelson said. Don Buxton, executive director of Chesapeake Chamber Music, helped the congregation choose the 7-foot grand piano that will occupy the right front corner of sanctuary. On the north side, a 3,000-square-foot patio with a large pergola faces a broad expanse of rural countryside. “A wildflower meadow will be planted, and 114 trees are coming in as soon as it warms up,” Meyer Mickelson said. Landscaping will feature “at least one fig tree and one pomegranate tree,” Hyman said. Larger weddings, mitzvahs and receptions can be accommodated in the new building, which features a professional kitchen and bride’s room. Rooms and spaces can rented by members of the congregation and the wider community. The kitchen can serve 150 at a seated event and 250 at a combined standing and seated event. A large classroom area will be able to be subdivided by sound-proof panels. “We’ve never had classrooms before,” Hyman said. On the south side of the building are a conference room and offices for the rabbi, a future executive director, the congregation treasurer and receptionist. Portions of the old bimah form the bookshelves in Hyman’s new office. Other features of the old synagogue will be placed in the new building, as well. “The Jewish star from the old building is coming with us,” Hyman said. The congregation raised $6 million, enough to pay for the land, the building and an endowment. Names of donors will be featured throughout the building. “The time was right,” Hyman said. The building committee started with Hyman and 10 members, which eventually became five members once construction started. “People with amazing skills in this congregation stepped up,” Meyer Mickelson said. Real estate developer and first vice president of the congregation Frank Menditch of St. Michaels is chairman of the building committee. Dennis Podolny, an attorney and engineer whose last project was the Hong Kong International Airport, retired to Taylor’s Island, joined the congregation and sat on the building committee. Also a congregant is interior decorator for the project Barbara Portnoy Levine Spector of Portnoy Levine Design Associates in Baltimore. Portnoy Levine Spector partnered with Lori Brown of Levin/Brown Architects of Baltimore, Meyer Mickelson said. The contractor is Willow Construction of Easton. “It’s been a very wonderful experience with people welcoming us,” Meyer Mickelson said. “And the truth of the matter is, our elected officials and our city leadership and our county leadership — they have been unbelievably welcoming, and not only welcoming, but excited about it,” Hyman said. “My expectation is that the same openness, the same sense of community involvement, the same sense of being a leadership institution within the community will maintain and perhaps even expand a bit, but certainly not diminish or change once we’re moved in,” Hyman said.